Claire & Alex are celebrating their love with an engagement photo shoot at the University of Miami! Your engagement photo shoot is a such a fun way to celebrate your love together before your wedding day! While there is no shortage of amazing locations to shoot your engagement photos in Miami, I always love when my couples pick a spot that has a special personal meaning to them. Claire & Alex both met while attending the University of Miami, so it’s no surprise that we took it back to where it all began when it came time to shoot their engagement photos! If you need suggestions on a location for your engagement photo shoot in Miami, I am never in short supply of gorgeous venues where we can meet! But, just know that if you are already ‘kind of’ thinking about the local park where you walk your dog together or taking some glammed up engagement photos at Vizcaya, then you should trust your gut! If you have questions or concerns about these locations, or even the proper days or time to shoot then we can always work out the fine details together! 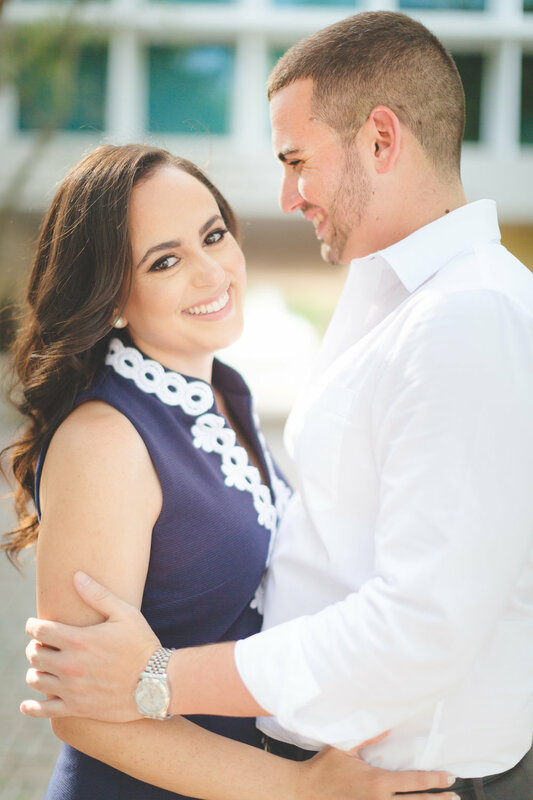 Claire & Alex’s style for their engagement photo shoot at the University of Miami was definitely ‘casual glam’ Claire wore a dainty, neutral colored, low heel for her shoot which turned out to be perfect for all of our walking around campus! She paired that with a navy blue sheath dress which was outlined in a gorgeous white pattern. Her groom to-be, Alex, wore a white dress shirt, no tie, with slate gray dress pants and a stylish leather belt. These two were so adorable walking all over campus together holding hands, and kissing by the fountain! Keep scrolling to see more of Claire & Alex’s engagement photo shoot at the University of Miami! Searching for the perfect Miami Engagement Photographer to capture your love story? Click the >> contact button << and let’s chat!